Jonathan Rosenblum lives in Seattle, Washington, and is a member of UAW 1981/National Writers Union. 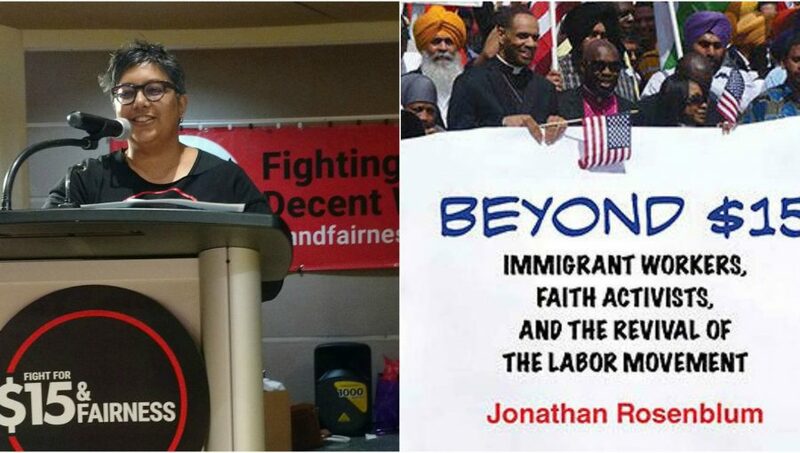 He is the author of Beyond $15: Immigrant Workers, Faith Activists, and the Revival of the Labor Movement (Beacon Press, 2017). More about him can be found at jonathanrosenblum.org. The interview was counducted by Yuri Lobunov, editor-in-chief of socialistalternative.ru, where this interview was published in Russian. Yuri Lobunov (YL): How was the idea of ​​the “fight for 15” born? Jonathan Rosenblum (JR): Big ideas sometimes start small. Fast food workers in New York City were the first workers to raise the banner demanding “$15 and a Union.” In late November, 2012, 200 fast-food workers in midtown Manhattan took to the streets for a one-day walkout to demand a $15/hour minimum wage – more than double the national minimum – and union recognition. For a city of 8 million people, it was a small protest, but for low-wage workers around the country, this bold call for $15 and union recognition pressed beyond the limits of their imaginations. Union organizers were used to talking about more incremental gains, like 50 cents. And previous wage demands weren’t typically tied to union rights. 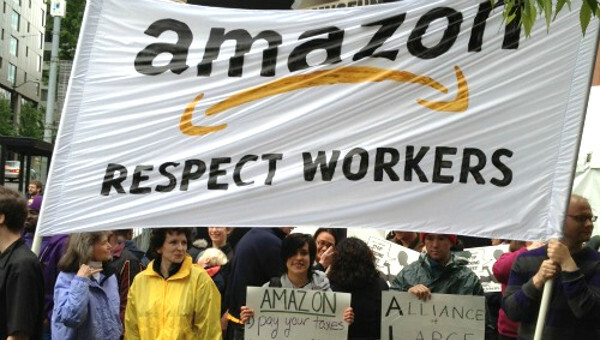 Such a big demand seemed absurd – until the New York workers issued it. YL: What was the path from doubt and lack of belief in possible success – to broad support? 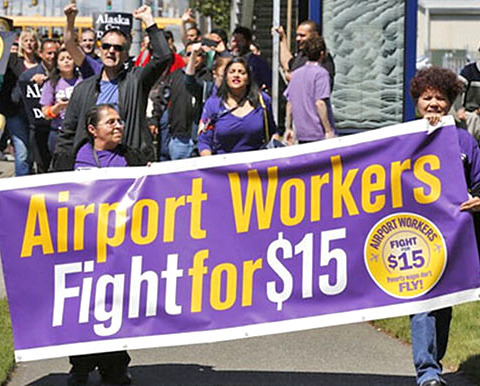 As with other victories, even local ones, the Sea-Tac win gave confidence to workers elsewhere, and raised their expectations of what they deserved and should fight for. Starting with the Sea-Tac win, these wage fights echoed throughout the country and led to victories now benefiting millions of working people. I think it’s important to begin to examine your question – how do we move from doubt and lack of belief in success? – at the street level. We see how these fights profoundly transform activists. They begin to insist that a better world is possible – and indeed it’s necessary, even in the face of daunting obstacles. Here’s one illustrative story, which I tell in my book, Beyond $15: Immigrant Workers, Faith Activists, and the Revival of the Labor Movement : One of the leaders of the Sea-Tac campaign, Habiba Ali, came from Somalia and began working at the airport as a wheelchair attendant in 2011. She became active in the campaign, and endured the roller-coaster of the next few years. She was elated when we won the $15 ballot initiative, but then became disheartened after the airlines, the airport commission, other big businesses, and the court all came together to block pay raises for her and thousands of airport workers. Habiba formed a union of wheelchair attendants, and then saw her employer and the major airline at Sea-Tac, Alaska Airlines, conspire to try to stop a union vote. Habiba and her co-workers overcame a fierce anti-union campaign from management and Alaska, won their union election, and negotiated a union contract with their employer. And after two years of litigation, big business and the Port lost their last appeal in court over the $15 initiative. Habiba got back pay of $6,300. Some full-time workers got as much as $28,000, equal to a full year’s worth of earnings. system all colluding to deny workers their due. Maybe, after all, she thought, workers were doomed to fail. Maybe we had aimed too high. YL: In Russia there is practically no struggle by workers for their labour rights. To a large extent this is due to the fear of individual repression by the employer. Was there such a fear in Seattle? How did you manage to get rid of it? JR: There certainly was fear in the workplace, as there is in all workplaces in the U.S. because of the dominance of capitalist ideology and the reality that labour laws fail to protect workers and our civil rights. We overcame worker fear through the campaign, but it would be an exaggeration to suggest that we got rid of it. Taking on fear is a constant struggle in any organizing. lectures in front of passengers – all that and more had been customary, on top of the low pay and lousy working conditions. Typically this maltreatment had the added racial dimension of a white manager mistreating an immigrant person of color. What changed that was workers engaged in collective struggle. They confronted management. Sometimes these actions were small-scale, like a delegation of six workers going to a manager to demand safety equipment. 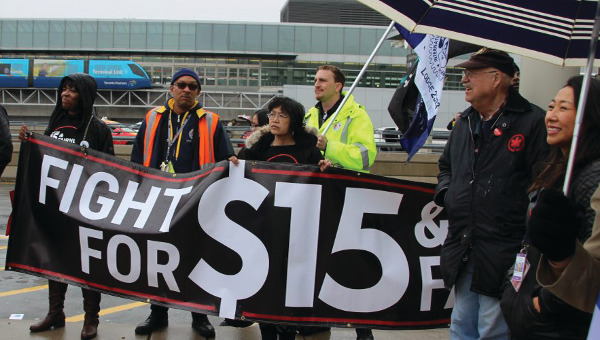 Sometimes they were bigger actions, like hundreds of workers, backed by clergy and community allies, delivering petitions for fair pay and treatment to the headquarters of the main airline at Sea-Tac. Even if we don’t see immediate results from an action, the mere fact of confronting the boss emboldens people. They gain confidence as they assert their rights. During the Sea-Tac campaign, delegations of workers and supporters went to all of the major airport employers demanding union recognition. Not surprisingly, all of the employers said “no.” Some even locked the doors on us and refused to talk! But the very act of confronting management upset the social order within the airport. We disrupted the labour-management relationship. Word spread about the delegations and management’s response. The prevalent term that workers came to use in talking about what happened was “fear.” For the ﬁrst time, they had seen their managers shrink at the sight of workers coming together: hiding behind doors, refusing to come out of their ofﬁces, sending low-level managers out to declare that the chief boss was unavailable. Hoopes told me how he and his coworkers returned to their regular work shifts to ﬁnd their supervisors more cautious, more restrained in directing the workers. The workers had confronted their managers, and now they saw fear in the eyes of their superiors. The conﬁdence was infectious. It revealed the emerging power of airport workers, and in doing so opened a window into the future possibility of a more digniﬁed existence. YL: In Russia, society is very atomized, often people are ready to betray a common idea for the sake of personal good, and this leads to the appearance of strikebreakers. Was there such a problem in Seattle? JR: Of course we have these problems too, because big business executives and their political allies are very deft at manipulating people’s anxieties to divide the working class. This is true at both the local and national levels. This way of thinking didn’t originate in the working class, of course. It’s imposed and reinforced by the political establishment, through their control of the mainstream media and culture, as a means of dividing workers and keeping them collectively weak. shipped jobs overseas, but rather immigrants, African-Americans, women, and Muslims. 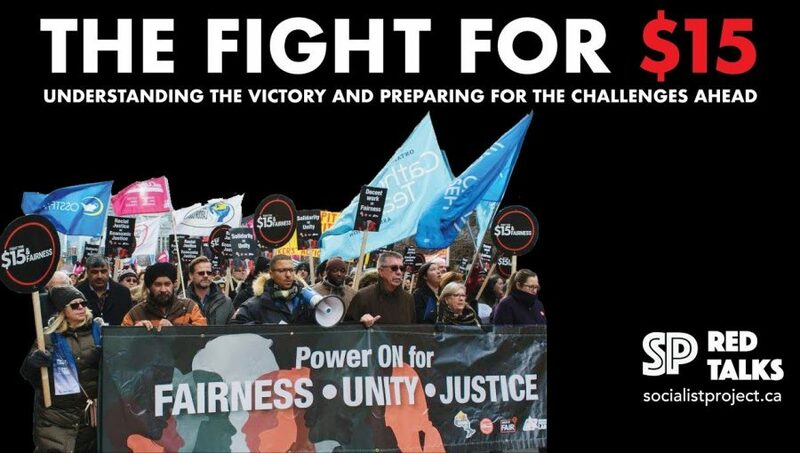 Whether on the picket line or in the political arena, we have to struggle with our brothers and sisters to overcome these intentional campaigns to divide us. We have to show, not just in words but in our actions, how our fates are tied together, no matter our race, nationality, gender or religion. The atomized nature of society that you note in your question is not unique to Russia. I’m working now with a group of workers in an academic environment, and they often describe feeling isolated from one another. Likewise, it’s easy for precarious workers, like Uber drivers, to feel alone. Our job as organizers and justice activists is to break down the barriers that create isolation, to help people connect to one another so they come to see that they share common interests and need to work together. YL: In Russia, the phenomenon of “learned helplessness” is observed – the negative experience of upholding one’s rights leads to submissiveness and passivity. How to instill hope and faith in their own strength? JR: Russian workers have been through some huge challenges in the last generation, and I can only imagine how difficult things must be. I think that people have to find their own, sometimes distinct, paths toward recognizing why we must work for a better world, and how to proceed. For me, this means looking at our struggle as not just economic or political, but rather one that also has a moral foundation. That means any movement must draw upon the values that emanate from our deepest human emotions and desires for justice and community. These are universal values, spanning race, ethnicity, and national borders. The call for spiritual morality, whether advanced by organized religion or secular humanist yearnings, has played a decisive role in leading struggles throughout history, in my country and yours as well. In the USA, the civil rights movement of the 1950s and ’60s and the abolitionist movement of a century earlier are but two examples of struggles that were propelled forward by powerful calls for spiritual morality. In Russia in 1917, workers were not just throwing off the economic yokes that tsarism had imposed on them; they were claiming moral ground, their right to live as full human beings. YL: What is more important in the struggle for labour rights – a bright and strong leader or a willingness of society to act together? JR: Well, that’s any easy question to answer! Collective action and large movements will always be more important than a bright and strong leader. Indeed, I think that both of our countries have agonizing examples of the limitations – and indeed, grave crises – that develop when any movement becomes reliant on a single leader or a small cadre of leaders. The key is democratic accountability, as democracy accomplishes two things: First, it holds leadership accountable to a popular base, and second, it engages ordinary people as the driving force in a campaign. In my experience, workers will take extraordinary risks and endure tremendous sacriﬁce – as long as they have ownership over the movement. A smart, charismatic leader can rally a movement, but you need mass, democratically-led action to sustain it over time. YL: Imagine a group of depressed people who have lost hope for justice and are confident that nothing depends on them. Where to start, so that these people turn into a strong social movement and achieve their goals? JR: Sometimes you have to start at small, at a single workplace or in a single community. Even small fights teach lessons, build relationships, and develop confidence. YL: The destruction of socialism in Russia has transformed the idea of ​​social justice into a marginal idea: it is generally accepted that socialism has shown its non-viability. The society is dominated by free market ideas and fierce competition. Is it possible to fight for labour and social rights in this situation? JR: You may find that the best place to fight for labour and social rights is where the economic contrasts, the injustices, are most pronounced. And I’d encourage you to not start at the ideological level, but rather close to the ground. Productive organizing discussions start not with pronouncements but with questions: Why is it that we are struggling to make enough to live, while the wealthy few control so much? Why do our elders have to fight to hold onto their public pensions while government sells off businesses to capitalists? Why are many of us facing housing insecurity while an elite few jet to their luxury villas around the world? Our first job, as organizers, is to get people to think. And once they engage on the question of why we have such vast inequality around us, we can begin to talk about what must be done. YL: What words of solidarity, what parting words do you say to those workers in Russia, who want to start fighting for their rights? JR: We may speak different languages and live in vastly different parts of the world, but as workers we share universal human desires: Happiness and harmony for ourselves and those around us, health and opportunities for our kids, dignity and security for our elders, food on the table and a safe place to live, a yearning for community and companionship, and good environmental stewardship of the world we live in. In short, we insist on claiming our full humanity as workers. The economic system of capitalism, in placing profits before people and corporate interests before community and the planet, is irreparably in conflict with those human values. Whether in Russia, the U.S., or another country, our job is to define and hold onto our vision of a just, humane society; to demand it, even when the opposing forces arrayed against us appear to be overwhelming. Yuri Lobunov is editor-in-chief of the site socialistalternative.ru. Deena Ladd and Jonathan Rosenblum – The Fight for 15 – What Next?